Reale is the restaurant of chef Niko Romito and his sister Cristiana in the mountain town of Castel di Sangro in Abruzzo. 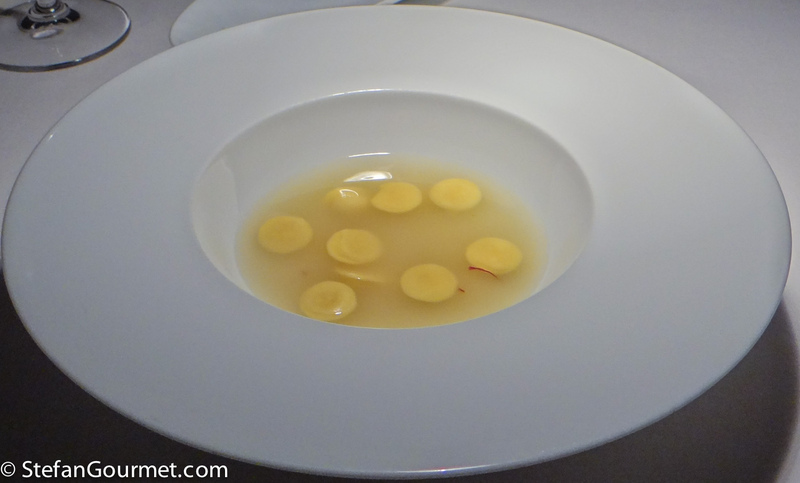 I had been curious about this restaurant with tre forchette from Gambero Rosso for a while, but it was always too far from where we were in Italy. 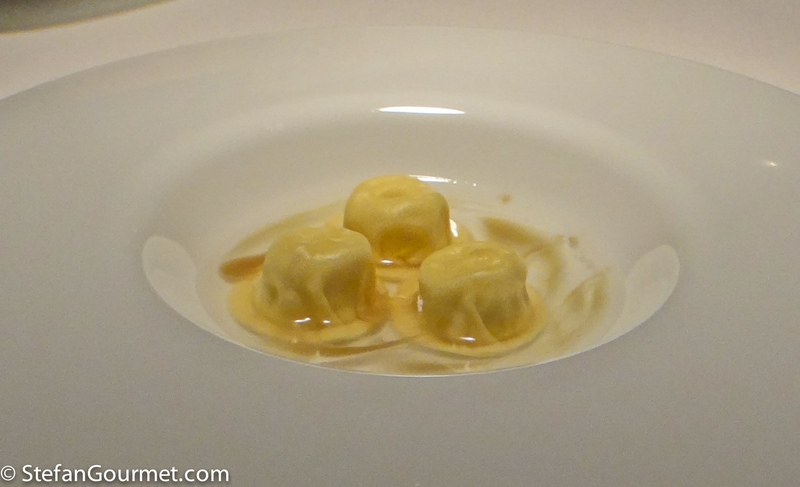 When Reale got its third Michelin star, I decided to do it the other way around, and build our itinerary around a visit to Reale. And so I started by making a reservation at Reale and then built the rest of the itinerary for our vacation to Italy around it. It goes without saying that the expectations for our dinner were high. 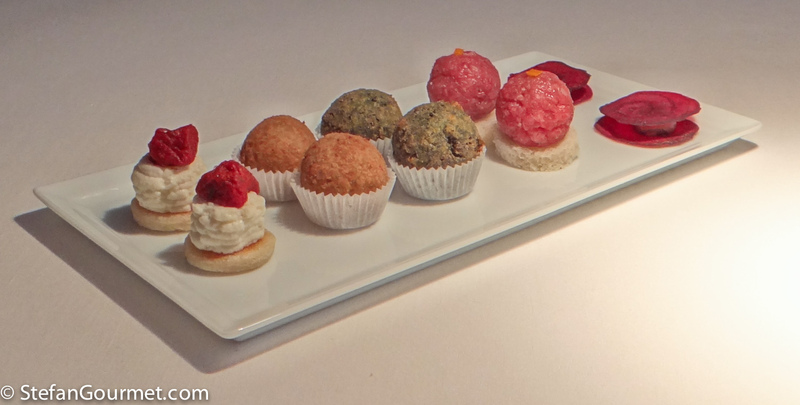 The restaurant offers two degustation menus: the set menu “Essenza” (5 courses for 100 euros, 50 euros) and the mano libera menu “Ideale” (8 courses for 150 euros, 90 euros for matching wines). 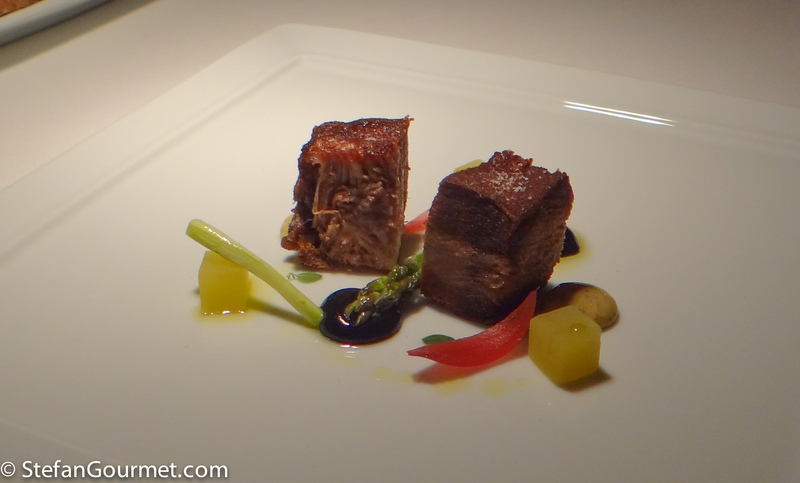 Ideale can be extended with two more new courses (that are not yet on the a la carte menu) for 30 euros extra. We opted for “Ideale” without the extension. 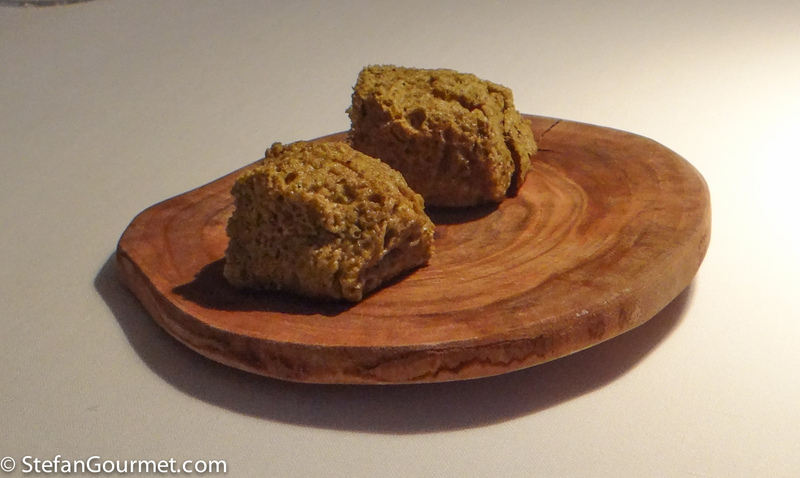 The first amuse bouche: warm fluffy pistacchio cake. 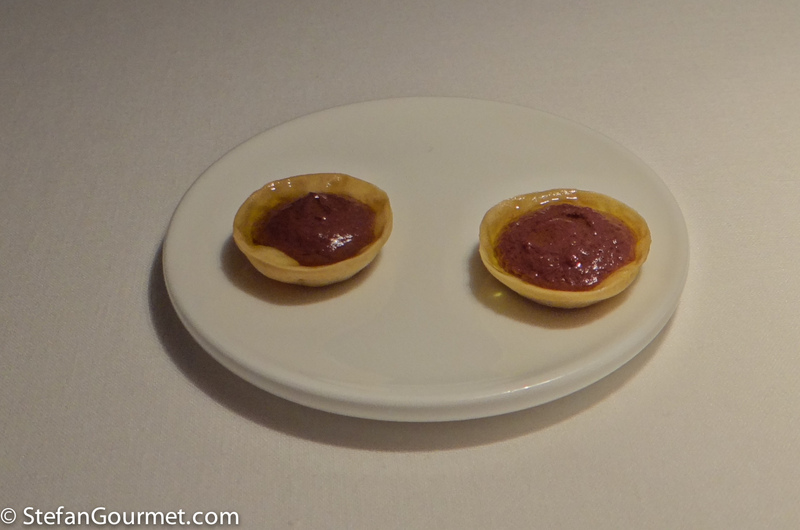 The collection of amuses that followed were very nice, with our favorite a crisp of beet with rabbit liver. Crispy pastry with black olive and olive oil. 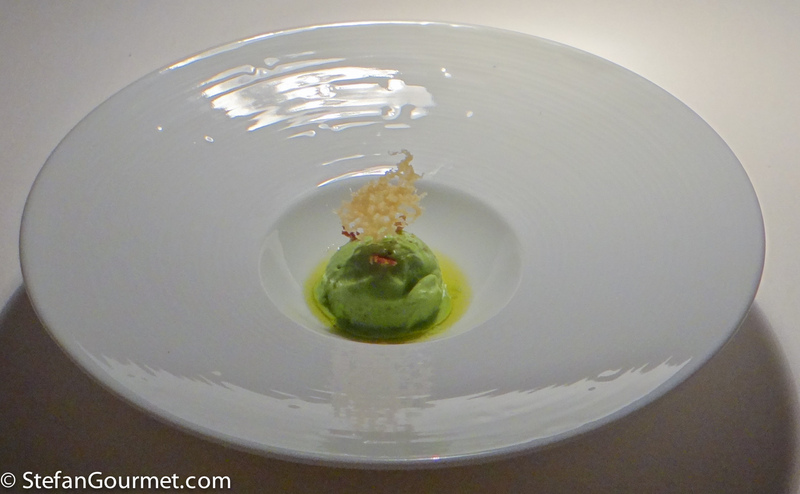 The final amuse was really nice as well: pea ice cream with crispy pancetta and parmigiano. 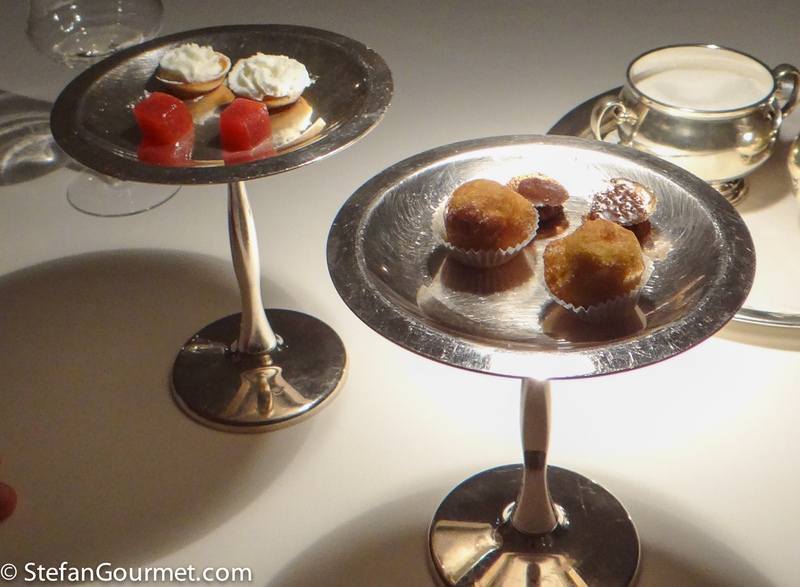 9/10 for the set of amuse bouche. As a matching wine a Pecorino from Abruzzo, a very nice crispy white with great minerality and nice white fruit. Unfortunately, the crisp wine didn’t work for us in combination with the unctuous beef and mayo, and the wine also overpowered the elegant flavors of the dish. 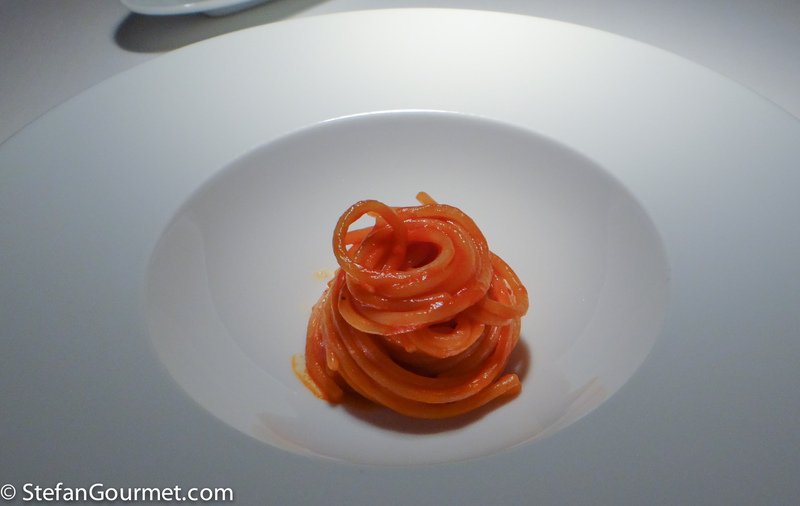 The same Pecorino was also served with this dish. 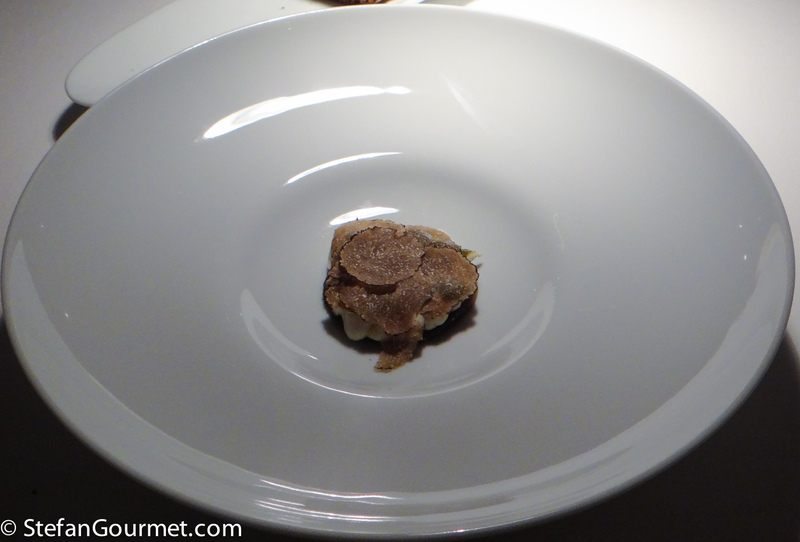 It worked a lot better than with the beef emulsion and was actually one of the best matching wines of the evening, but I thought it was still a bit too crisp for the dish. The wine served with this dish was a blend of chardonnay and a local grape from Calabria, a nice wine with elegant use of oak. It was nice with the onion juice, but the parmigiano blew the wine away. Again the wine was ‘recycled’ for this dish. 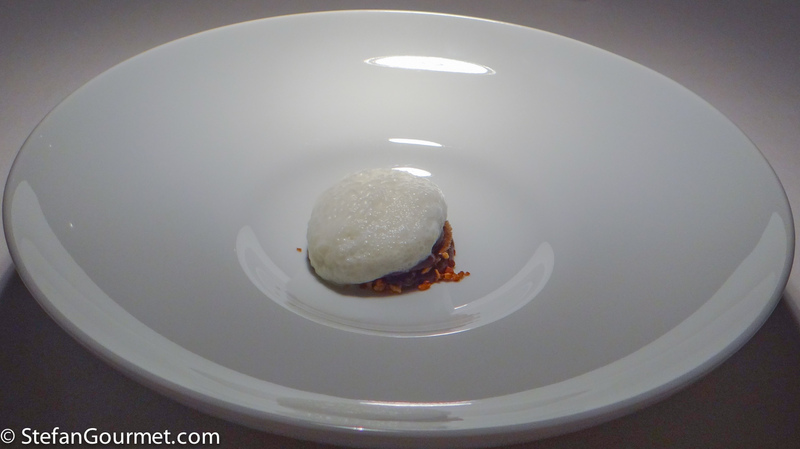 The Calabrian white didn’t clash with this dish, but it didn’t work very well either. For the wine another Pecorino with an even nicer minerality than the first. Unfortunately again too ‘fresh’ for the dish. I hate to say it, but again the wine pairing did not work. The same Pecorino as with the previous dish made the tomato sauce taste too acidic and distracted from enjoying the dish, which may very well have been 10/10 with a good matching wine. The wine pairing with a red from the Etna was okay (but not the ‘miracle’ as promised by the sommelier). It was nice that the wine was served slightly chilled, as so many Italian restaurants serve their reds too warm. The wine pairing with an eiswein from Austria was nice. 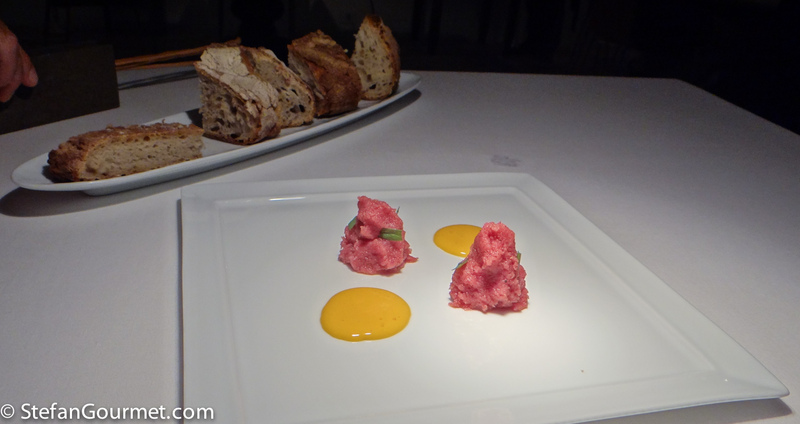 I can see why for this dish the sommelier went outside of Italy to find a wine with the right acidity. The meal ended as usual with coffee (made with a percolator this far south in Italy) and sweets. The wine pairings aren’t terrible, but not good enough compared to the quality of the food. I really wonder if the chef has tasted the wines that are served with his food himself. He puts so much effort in creating harmony on the plate, and the wine pairings distract from that. It may be a cultural thing to pay less attention to wine pairing, as we saw another table with a group of Italians ordering big red wines with all of their meal. But as we know from experience how matching the right wines can take a dinner experience to the level, that is what we have come to expect of restaurants with three Michelin stars. At 90 euros, the wines are too expensive for what is offered. Wonderful food but what a shame about the service and wine. In a restaurant of this quality they really should get this right. That small portion reminds me of Japanese dishes, very elegant and zen. I have to remind my American self to strive for that! Quite an unusual experience to scroll thru’ this menu – very much a ‘purist’s’ experience methinks. Usually I can kind’of ‘taste’ many of the dishes from your descriptions . . . this time it has been more of a very interesting read! Odd about the wines when so much thought and effort has gone into the food. Expensive compared to some of the other meals on your trip this time around.